A stream of fans already fearing the worst had laid out flowers, football scarves and Buddhist prayers outside the grounds after Saturday's accident in tribute to Vichai Srivaddhanaprabha. 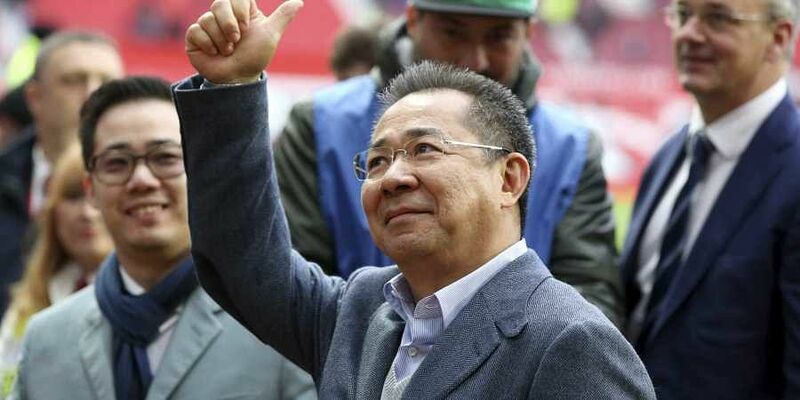 LEICESTER: Leicester City's Thai billionaire boss was among five people killed when his helicopter crashed and burst into flames in the Premier League side's football stadium car park moments after taking off from the pitch, the club said on Sunday. A stream of fans already fearing the worst had laid out flowers, football scarves and Buddhist prayers outside the grounds after Saturday's accident in tribute to Vichai Srivaddhanaprabha -- the man they credit for an against-all-odds Premiership victory in 2016. Vichai, 60, the owner of Thailand's King Power duty free empire, was a regular at matches who used to fly to and from home games. He and the four other victims, who have not been named, boarded the blue craft, which took off from the middle of the pitch once the stadium had emptied after Saturday's 1-1 draw with West Ham. Images showed orange balls of flame engulfing the wreckage in the car park at King Power Stadium -- the scene of unbridled jubilation after Leicester's Premier League victory two years ago. Prayers and tributes poured in from across Britain from the footballing world and beyond for the jovial man many credit with bringing glory to the central English city with the miracle-making club. "He's put Leicester on the map," supporter Cathy Dann, 55, told AFP. "He's made us big," she said, as aviation experts picked through small pieces of wreckage scattered on the stadium's edge. Among the tributes was an image of Ganesh -- a Hindu god also seen in Thai Buddhist temples. England legend Gary Lineker, a former Leicester player who was hosting the BBC's Match of the Day when the accident happened, tweeted: "That was the most difficult @BBCMOTD I've ever hosted... A terrible tragedy. Heartbreaking." And ordinary fans in central Bangkok said Vichai helped develop Thailand's football as well, bringing the Southeast Asian country greater recognition in the sports world. Vichai bought Leicester City in 2010 and moved to chairman the following February, pouring millions into the team and becoming a beloved figure in the club and the city -- a feat not always achieved by the Premier League's foreign owners. Vichai's investments in the club helped return them to England's Premier League from the second-tier Championship in 2014. They initially seemed outclassed by richer and more established rival from London, Liverpool and Manchester, languishing at the very bottom of the table for most of the 2014/15 season. The Foxes, as the team are nicknamed, then engineered what fans now fondly refer to as the "Great Escape", winning seven of their last nine matches. The success also qualified them for the first time for the lucrative Champions League, the pinnacle of European football played by the continent's most successful sides, including Barcelona and Real Madrid.